I'm looking forward to Wes Anderson's, "Fantastic Mr. Fox." I saw the trailer and immediately thought of this bizarre British taxidermy from an even more bizarre volume in the Trad library, The Saturday Book published in 1953. My friends in London sure like to knock Yanks...but...as far as I know, playing house with stuffed rats is all their own. I bought those braces in Lord & Taylor years ago. And like the Duke, I paid handsomely but expected a long life in return. Twenty two years isn't bad. They're a little narrow, which was the style then, but who cares - - They're unique, good looking and I've never seen them on anyone else. It will be my mission in life to insure they don't wind up in some hipster's closet who had $2 to spend in a thrift store. These will go to an appreciative home I already know. Stouts always remind me of a fox and Brooklyn Lager's, Black Chocolate Stout is no exception. Whether it's sitting by the fire place at the Red Fox Inn and being surrounded by more fox art than you can shake a riding crop at -- or -- whether it's seeing a red fox in the woods...amazingly small, deceptively agile and seemingly always up to no good...kind'a like me. At 10% alcohol- it's deceptive alright and dangerous. Huge creamy and thick. More body than my old favorite Imperial Stout by Samuel Smith ... this Stout goes down far too easily but, like a good vintage Port, I can't think of anything better to savor by a fire on a winter's night with Stilton and walnuts while I listen to 'The Fox' by Odetta. Mmmm, stout! I can feel my pupils constricting like in the old Guinness commercial. It's one of the few "beers" I'll drink alone or without food. Don't think I've tried the Chocolate Stout, though. I was lukewarm about the Fox movie trailer until I realized it involved a heist. 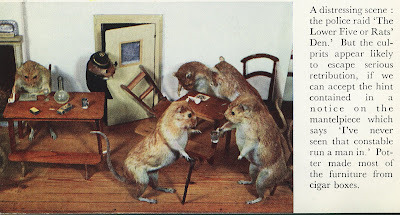 "Who wakes up one day and says to themselves I really need to make a tableau of a group of stuffed rats..." Prisoners? "Our little pipestem has a resident fox..." Is your grey goose missing? "How did you happen to visit Middleburg?" I lived in Old Town Alexandria in the late 80's. A $575 studio on St Asaph St. I loved the Red Fox for Sunday Brunch almost as much as I loved the Quarter Deck in Arlington for crabs, the Tune In on the Hill for burgers, or the Chinese place in Old Town that ruined an Orvis bag with a leaky container of Moo Shoo pork. DB- The Chocolate is my new favorite stout. It's amazing and a buck less than Smith but be warned...it's powerful. The Brits are knocking Mr Fox already but what do they know. They can't keep their socks up. Everyone needs an icon - I'm a penguin man myself. I would like to try BBBCS as a black and tan. My socks were once knocked off by a wonderful b&t made with Young's Double Chocolate Stout and Bell's Oberon Ale. It's a good combination. Those fox faces are just CUTE - you should wear those when you go see FMF and see if anyone notices. Thanks for another great Friday belt. Apropos of your penchant for the Southern Ivy, I am confident you will enjoy this article from The Journal. Ping me if you can't see it and I will send you a pasted version. I'm a big fan of Wes Anderson's films. Fantastic Mr Fox is my favourite Roald Dahl book. But their styles aren't compatible - and that's what ultimately sours this movie for me. Visually, it's brilliant. The animation is wonderful. It looks just like any other WA film. Lots of detail. Lots of camera pans and "square" shots. Title cards. Fantastic. 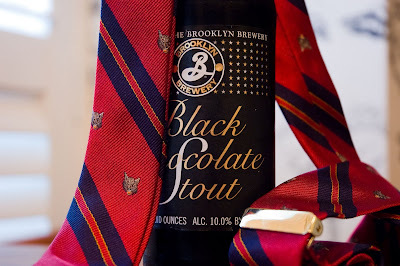 I love the Brooklyn Brewery Black Chocolate Stout. I saw it on sale in a Dublin off-licence late last year and though it was the best chocolate tout I have ever tasted. I hope they get some more in stock this year. You ever see the ones of the frogs. Frogs playing pool, fogs playing cards ect. Do I see another fellow from the Old Dominion? The Red Fox is a stone's throw from my old hometown of McLean. 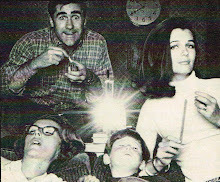 I discovered this happy little corner of the web a month or so ago and have had a great time catching up. Thanks! Hampton and Old Town Alexandria. Army brat. Mucho moves but never to a place like Florence. Thanks for your compliment and visit. And never oil in croissants.